← Fr. Z’s Kitchen: Bronzino! 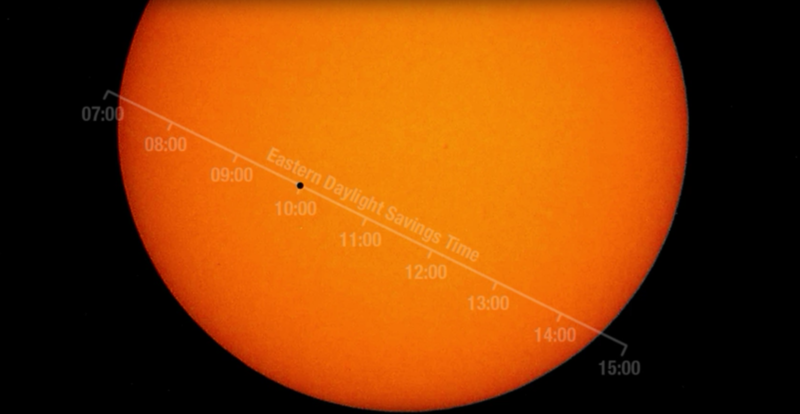 Just Too Cool: 9 May – The Transit of Mercury! It’s not quite as nifty as the Transit of Venus (for which Sousa wrote a march), but it is still very nifty. As viewed from your planet, Mercury will pass in front of your yellow sun on 9 May. It only happens about 13 times per century and hasn’t happened in nearly a decade, but on Monday, May 9, Mercury will transit the sun. A transit happens when a planet crosses in front of a star. From our perspective on Earth, we only ever see two planets transit the sun: Mercury and Venus. (Transits of Venus are even more rare. The next one won’t happen until 2117!) On May 9, as Mercury passes in front of the sun, viewers around Earth (using the proper safety equipment) will be able to see a tiny dark spot moving slowly across the disk of the sun. Go over there for tips on HOW TO WATCH IT. For example, if you are human don’t be stupid and stare straight into your planet’s yellow sun with your naked eyes. Now for the bad news: Mercury is so small, you can’t see the transit with the unaided eye. Safely-filtered solar telescopes are required. Don’t have one? In that case, you can watch the transit online, broadcast live from the Coca-Cola Space Science Center in Columbus, Georgia. Also, NASA’s Solar Dynamics Observatory will transmit images from space. This entry was posted in Look! Up in the sky! and tagged transit of mercury. Bookmark the permalink. 6 Responses to Just Too Cool: 9 May – The Transit of Mercury! We’re lacking a “Transit of Mercury” march. Clear skies so far where I am. Hopefully this evening, too! Well, to see a transit, you have to be farther out than the planet and the sun has to be big enough relative to the planet to easily see (its a trigonometry problem). That is why you won’t see a transit of Jupiter, for instance – only Mercury and Venus, since they lie closer to the sun than the Earth. P. S. The relative size of the sun and Pluto at the distances they are from each other may mean that Voyager would not have the resolution to see any such transit (I haven’t done the calculations).